This is a fun Antique Image from an Old Advertising Card! the card was used as an advertisement for an Organ company in Ohio. 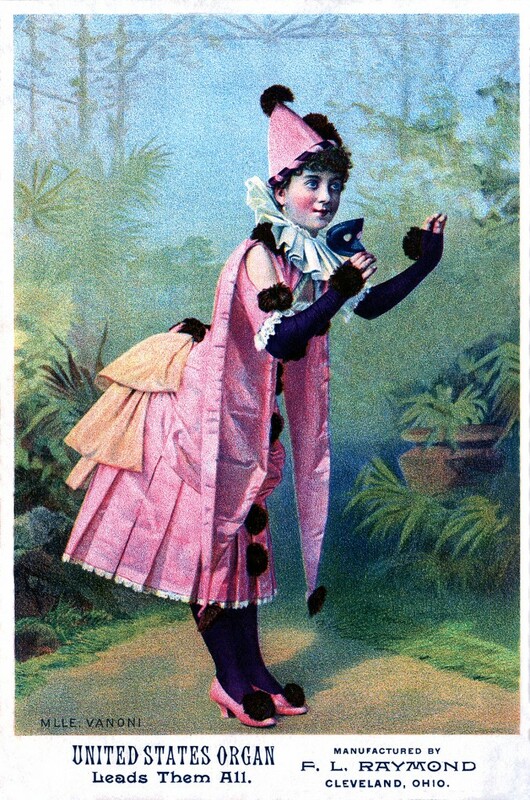 The picture shows a cute young lady wearing a Pierrot Clown type Costume, complete with the cone shaped hat and Pom Pom embellishments. She’s holding a mask in her hand, perhaps she is about to attend a Masquerade Ball! If you like this one, you might also enjoy the fabulous Photo Card of a Pierrot Lady Here. A fun one to use in your art! 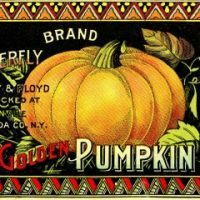 Vintage Halloween Clip Art – Pumpkin Label Vintage Advertising Clip Art – Stunning Ice Cream Girl Paris Creamery Ephemera! She is adorable……a Columbine of pert beauty ready to hide behind her mask when Harlequin arrives. I love the colours and black bobbles on her dress make it so special. I have old family photos of an aunt long passed who is dressed in a lovely clown attire in b&w in a proper photography studio. One of our proud possessions. Oh that sounds like such a wonderful family treasure Amanda!